Our Outdoor Wooden Garden Potting Bench aims to save gardner's knees, back, and any other body part. 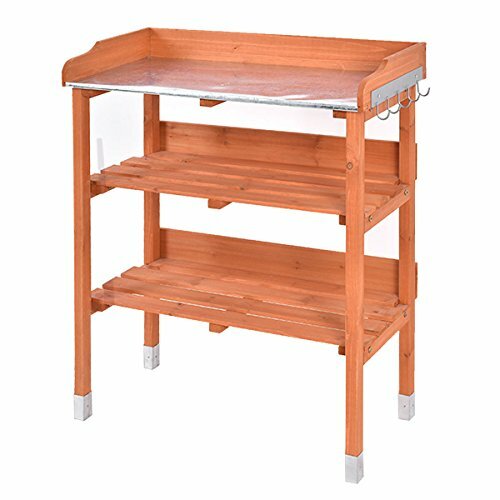 The Wood potting bench is here to take all the aches and pains out of gardening. You can stand comfortably to do all your potting. Spacious work top capable of various garden tasks and two lower open shelves for storing your potting tools, seeds and so on. One iron hook on side for handing tools, too. The station is made of solid wood and structured well. It is sturdy enough to meet both your outdoor and indoor potting job. Put it at small patios, decks, condos and apartments, or anywhere you'd like to grow vegetables, herbs, or flowers and enjoy your job.